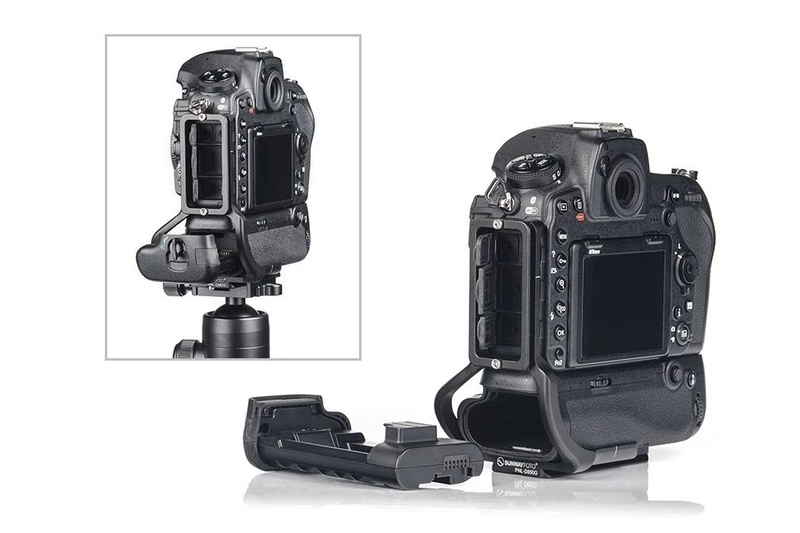 Sunwayfoto® announced today the release of their new Custom L Bracket for the high end Nikon D850 DSLR Camera equipped with the MD-B18 battery grip. 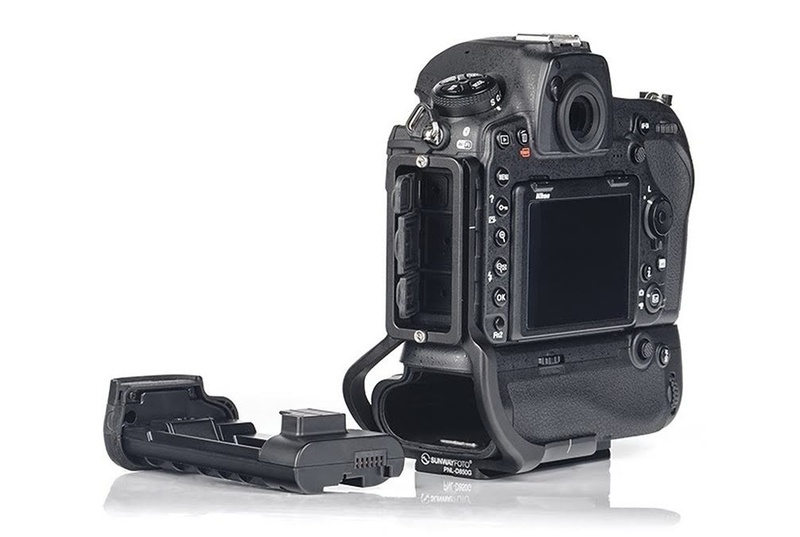 The new PNL-D850G L Bracket is similar to the PNL-D850 for the Nikon D850 bpdy (Preview) and the PNL-D810R dedicated to the previous Nikon D810. All these L Brackets are designed to sit a little further away from the camera side. 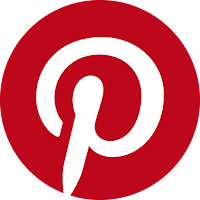 This is due to some distance required for the rubber cover doors of side connector ports, to open. However, further experiments had the PNL-D850G differentiated a little from the PNL-D850 as we'll see later on. 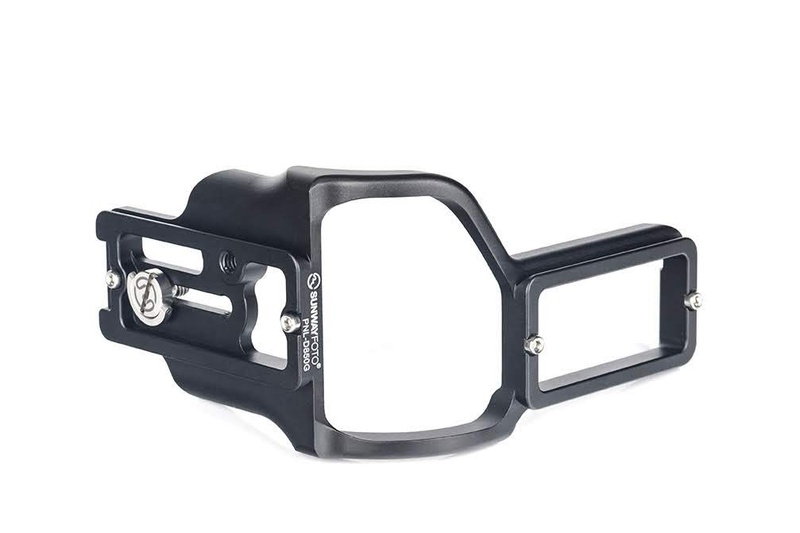 According to the latest Sunwayfoto trend the PCL-D850G L bracket is made of one piece aluminum block maintaining utmost rigidity. The large bottom plate is simple in design having raised lips on the front and rear covering half of the camera base in order to prevent the bracket from twisting. The rear side of the PNL-D850G shows the vertical plate distance on one side to allow for the rubber port covers to open while is kept closer to the camera body on the front side. Laser engraved "|" lens centering marks exist on both the vertical side plate and the base plate. In this view you can also see the strap loop at the inner end of the base plate. 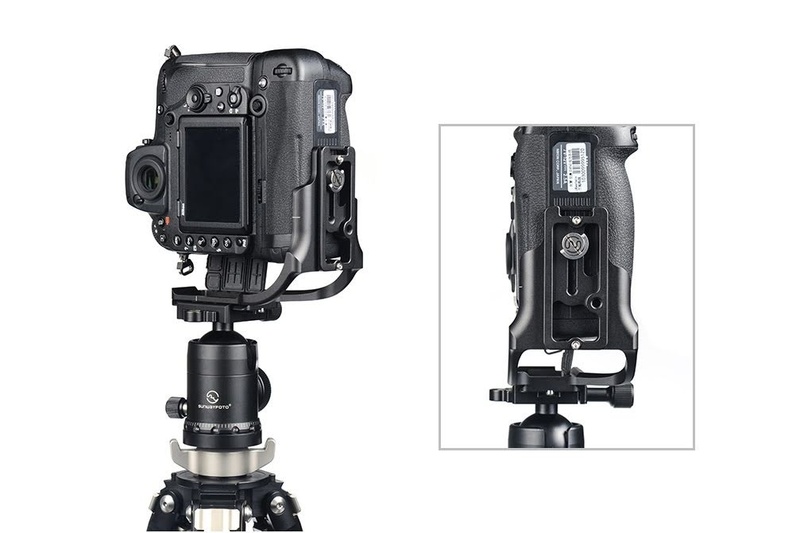 The side of the L bracket is quite wider in the lower part to embrace the MD-B18 battery grip and allow for the battery pack drawer be unloaded and reloaded freely. 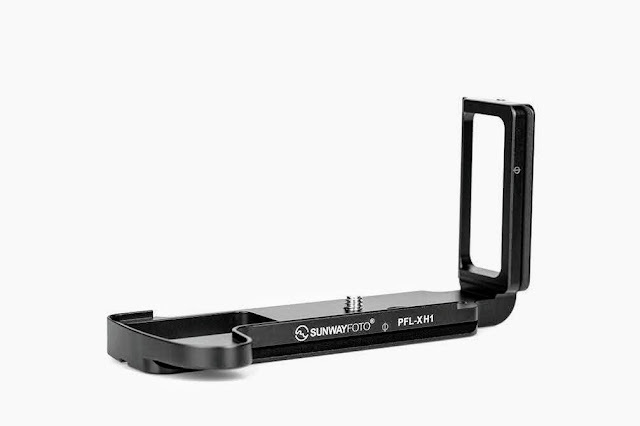 As far as I can recall from the PCL-5DIVG bracket, a new trend on large L brackets with battery grip option is to put the Sunwayfoto logo together with the model name on the side of the base plate. 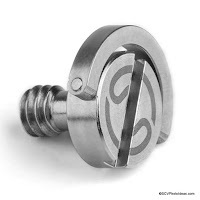 The L bracket bottom is hollowed out where possible in order to eliminate excess material, thus keep the weight down. Quite successfully considering the 126 gr in total. Both the vertical side plate and the base plate are equipped with two M3 safety stop screws each at their dovetail ends. The base plate dovetail and the side vertical plate dovetail are not aligned so there is need for a little re-framing when changing from landscape to portrait orientation and vise versa. We can also see here one extra 1/4"-20 tapped hole located towards the front side of the base plate. As with the PNL-D850 L bracket the large D-Ring 1/4"-20 mounting screw runs withing a long captive slot, that permits movement of the L bracket away from the camera side in order to accept large plugs when turned in portrait orientation. 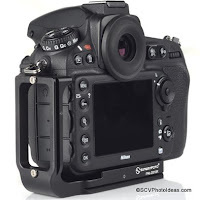 Sunwayfoto PNL-D850G L bracket bottom and side plates feature 4 safety screws. In the illustration below the exact dimensions and measurements of the L bracket are displayed. 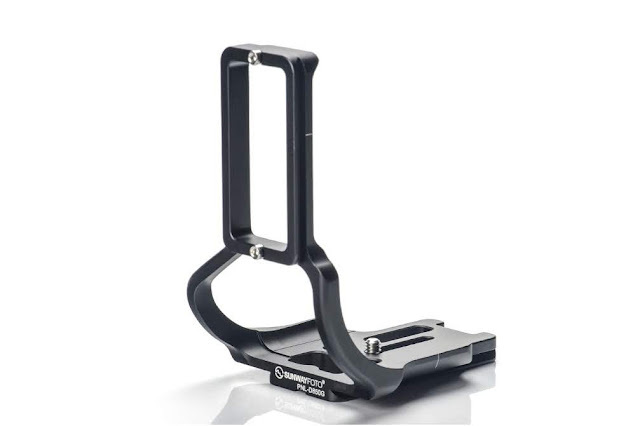 As well as the mounting screw captive slot length, which allows the vertical plate to be moved away by 28 mm from the camera side for extra clearance of the ports when sat in portrait orientation. The PNL-D850G L Bracket fits straight on the Nikon D850 without adding much bulk and allowing full access to the battery pack drawer. 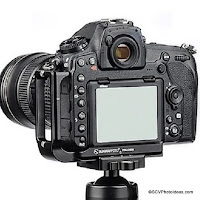 Nikon D850 with Battery Grip fitted with Sunwayfoto PNL-D850G L bracket in portrait orientation moved away from camera body allowing open connector ports with larger plugs. The PNL-D850G package, besides the L bracket, contains also all necessary screws and tools. In this case 4 x M3 safety stop screws for the bottom and side plates, 1 x 1/4"-20 large D-Ring captive screw and 1 x 2.5mm Allen wrench for the M3 screws. More than these, a velvet draw-string protective bag comes with it. Since 2016 the geometry of all Sunwayfoto dovetails has changed. Therefore, in this respect the PNL-D850G is compatible with almost all Arca style clamps including RRS lever release clamps. 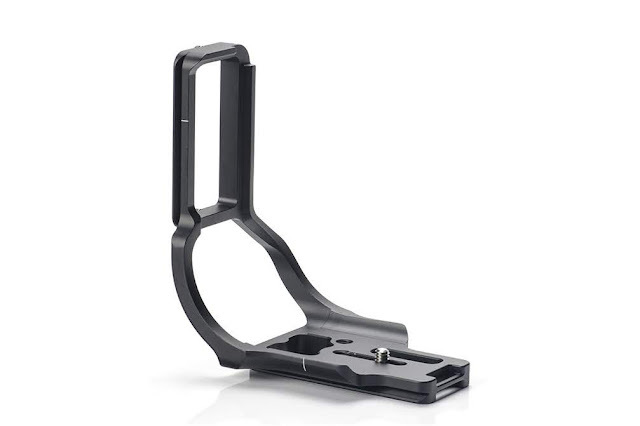 Recommended retail price for the PNL-D850G L Bracket is US$ 79.95 and will soon be available from Amazon or from eBay.